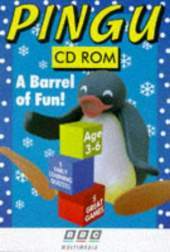 This is a compilation of educational games for younger children based on the clay-animated children's TV series Pingu. The game includes five puzzles involving letters, numbers, colours, sounds and shapes and five games for players to test their skills. The games include Music Time (record your own tunes and sing along to a select few), Ice Flow (where you need to help Pingu cross ice flows to deliver Robbie the seal's birthday presents), Snow Maze (help Pingu find his way around a maze, collecting items in the process), Fish Tennis (play against the computer or with a friend) and Building Blocks (a jigsaw puzzle-type game where you need to move the shapes to their correct places). It also includes five PC screensavers.